As I have not posted on here for a while due to frustrations of life, I want to get back into it. Since becoming an essential oil advocate, I have morphed with it. I went from not knowing much, to using oils straight up and learning more about blending them and creating products. Creating products are A LOT of fun. I find that this is THE BEST way to get use out of your oils AND to share them with others. I have not deleted my other oil posts although they have been edited due to compliance issues with the company I was with. I do not discredit the company at all. I just had to find a more affordable way to do what I love. Going with the past companies rules, until I have more info, I am going to just put my affliate link here and you can click on it to see the MANY oils this company has to offer.​ Please read over their website, join their FB page and do your research. There are many arguments about oils and I have done my due diligence and didn't not switch haphazardly. There will always be naysayers, and I am happy where I am at for now. This company has VERY affordable prices, many great freebies and specials. I pay the same price as you and you receive the same benefits as I do. So this IS NOT MLM. I have posted my affiliate link, and if you would, please, use that for your initial order; that would be VERY AWESOME. You need only go through the link once and sign up with an account, and then you can go directly to the site every time you order thereafter. The most AMAZING offer of the year, The Ultimate Healthy Bundle! Where else could you find soooo many ebooks, with so much AWESOME information, for you and your family!? The Ultimate Healthy Living Bundle - A complete healthy living library from top authors, plus $200 of bonus products you'll love. A $1030 value!! Something a little extra fantastic, for $10 more you can get this bundle for your e-reader -Kindle or Nook. In this bundle there is even an essential oil book If you wanted to just dabble in the healthy living without giving your arm and leg for info, this is THE BEST place to start - MORE than enough information to get you started, and if you find it isn't for you, then not much is loss - there is even a guarantee. Please use my link when purchasing, I SOOO much appreciate it. ACT FAST because this offer is only available until Sept. 15th! Wishing You Lots of Healthy Blessings! Sorry! I didn't realize how colorless this picture was! margarita like; hence Margarita Apples. Easy to make if you have Lime Essential Oil on hand. I use my handy-dandy Pampered Chef Apple Slicer to cut the apples. Use a glass plate or bowl. I use honey as a carrier for the oil. Put the honey on the plate/bowl, and drop the 2 drops of oil in and mix it around. 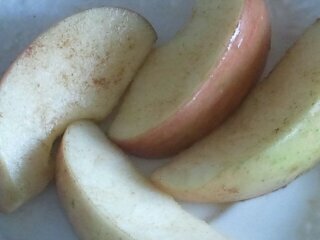 Put your apples slices on the plate/bowl and smear them around to get them covered with the honey-oil mix. Now sprinkle a tiny amount of salt, and sprinkle cinnamon so they look nicely sprinkled on = ) AND if you are using sugar, sprinkle sugar on now too. That's it. A pretty healthy snack. Lemon Drop Apples: Use Lemon with or without salt, sprinkle with sugar, and NO cinnamon. Some of the great uses for lime aside for using it in recipes are for bacterial infections, fever, sore throat, gum or grease removal; it can also help brighten a pale, dull complexion by removing dead skin cells. You can use it to make a fruit and veggie wash. Just think of all the money you'll save right there! That stuff can be expensive! Due to photo-sensitivity, if using topically, avoid direct sunlight 12 hours after use. I personally have never experienced problems, but those words must be said in case some is sensitive. Click here for a few more details on Lime. Finally! I can sit down and write again. = ) I have a few things that are sitting on the back burner in my brain, and I need to get them out. I decided today was a good day to release one of them. I woke up and decided I wanted to read about natural yeast bread-baking; it took me to artisan bread-making, and how we have morphed from the natural way of growing wheat and making bread to present day stuff we call bread. It is said, by this process, of using natural yeast, that for some, this bread might be edible for someone who has a wheat allergy or has a gluten intolerance, and possibly even someone who has Celiac's Disease, BUT by no means would I tell anybody, "It works, you should try it!" It is such an interesting read to find out about how the natural yeast "eats" the gluten and creates probiotics to aid in the digestion of the wheat. The longer it ferments, the better the body will process it. This is my VERY BRIEF summary. A sourdough bread maker in Santa Monica, who uses this process, claims he has people who have these problems with wheat, come to him at a farmer's market, and buy only his bread because they can eat it without side-effects. What an awesome thing! For those of you who would like to read more about that, here is a good place to start, and here is another. You may have noticed some key words above, natural, morphed and side-effects. One of the things about using essential oils is that they are natural, and when you use them, you are getting away from modern medicine that has been morphed from natural medicine, and therefore; when you use the essential oils, you will not get the side effects like OTC"S or pharmaceuticals cause because they have been morphed! Did you catch that?? (If you think about it, it resembles the things we have done to our food.) I'm not saying dump your doctor, but use what he is telling you and see if you can do something that may be less harmful to your body in the long run. Perhaps changing your diet, and using alternatives like essential oils, BUT make sure they are of the highest quality so you are getting the maximum effect. The most bang for your buck you might say! Why use a whole bottle of the cheap stuff, when you can get the same effect out of a few drops of CPTG Essential Oils, they are so pure you can take them internally to boot!! The EO's I use have trademarked their oils with a label CPTG - Certified Pure Therapeutic Grade - see above. Some of the popular questions that I get asked are "What is CPTG? ", "Why are they different?" or "How is it that I can take these internally? Isn't that dangerous?" Again, CPTG stands for Certified Pure Therapeutic Grade, the only thing that is trademarked is the logo. composition from batch to batch). The CPTG quality protocol requires the use of independent laboratories for standardization and testing." The testing methods in detail can be found here. You may be able to just say they certify themselves, but then again so do all of the other companies out there unless they have an organic or kosher certification, and even then, that is all that is being certified - whether it is organic or kosher. I would much rather have a company that goes through the many processes that this company does to maintain purity and consistency than a company who does not have this information so readily available. This is how WE are different. They ensure that their products are free of EVERYTHING but the plant oil it's self. You might say. "Beyond Organic." They are so pure that they CAN be taken internally. There are a couple that have a "do not take internally" mark on them (like Wintergreen), but use with discretion and talk with a naturopath or holistic healer about it. Do your research so that you know and are okay with what you are doing. When it comes to "ify" things, don't go with, "Well, the rep said I could!" I will tell you I have done something, but what you do is up to you!" rambling, here is a copy of the brochure. government agency did not certify them. I don't trust the government anyways with food and medicine. I am not worried about why so and so left a company, or that even my company is MLM. I stayed away from MLM for almost ten years. I avoided my companty for 2, but then I decided it was win-win for me. I was already passionate about natural health and essential oils, but I did not make money with it. With my EO Company, I have learned more than I ever thought I could learn, I have been able to help and educate more people than before, AND I make money with it. I am ready and willing to show ANYONE and EVERYONE the amazing powers of these essential oils so that you can use them on your family, AND make an income IF you choose! I am not sure this post went the way I wanted it, but it's out there! Please comment or ask questions! Anyway.....This retreat is exclusively for people who have acheived ranking of Elite or Premier, who belong to the same group, as I do. If you have ever been apart of a company like this, you may have noticed that usually the people who make all the money (who can already afford it), get to do special trips like this - Not Fair, I know! BUT, this event is put on every month, for anyone, in our group, who achieves the rank of Elite or Premier, they are the people who are working their butts off, don't make a ton of money yet, and don't usually get recognized, but who are the core reason why the higher ups are raking in the big bucks. SOOO, Alysse Sedovy and her husband Patrick have taken it upon themselves to put on this retreat monthly to reward those hard workers and to help teach them how to grow their business bigger and better! They flew people in, they provided massive amounts of delicious food and snacks, a wealth of training information, and even showed us how much money they make, and shared their reason "WHY" they choose do this business. On the first day (I happen to be close enough to be able to drive to this event), I drove an hour and half to do an intimate (50 people) "Meet with the owners" and get to ask questions. After 2 and 1/2 hours we took off and drove 2 and a quarter hours up into the beautiful mountains and canyons of Utah County, to a little hideaway, which just so happened to be an hour and a half away from my home. It was kinda funny that I was now so close to home. I checked in, and chose my cabin room and bed. 12 beds per room. I waited to make sure someone didn't actually need the lower bunk before I claimed it. I didn't really want to be sandwiched between two beds or have my head 18 inches from the ceiling - although those top bunkers did get a special prize! Those lucky dogs! If you notice on the vent there is an Aroma Ace Diffuser. Yes! We got to chose an oil to run in our room at night. Of course we chose Serenity. 12 people sleeping away from home, with all sorts of different sleep schedules, we thought this would help keep things serene = ) We seemed to have a few night owls in our cabin, but we all seemed to manage just fine! The bathrooms had 4 shower stalls and 4 sinks, and in each shower there was doTERRA's shampoo and conditioner and a bar of the soap, and on each sink there was the Skin Care Kit, EO Toothpaste and EO Foaming Hand Wash. These were there for ALL of us to use and experience. I had not tried ANY of those products yet, so I was STOKED, and extremely pleased with the quality of it all. lady I traded with during training when I was getting certified to perform Aroma Touch Massages. So to receive one by someone who has done many, was truly a gift! I slept so well, and bounced out of bed after only 5 1/2 hours of sleep! It has also inspired me to get on with it and get a massage table purchased so I can give those beneficial massages to others. We also had a Masquerade Ball. We dressed up in semi-formal attire, and got a little crazy with costumes and masks. Unfortunately I don't have any pictures of me, but you can see one of my roommates and new friend on the left. Doesn't she look fabulous!? We were also given an incentive that if we become Silver (another ranking), in 60 days, we will receive a limited edition Green Purse. $150 value. Some people are VERY inspired by this. Purses are not really my thing, but that won't keep me from trying! I found myself in great company. There was an NFL football player there. He had played for 17 years with the Green Bay Packers and Tennessee Titans. Name: Craig Hentrich. There was a Christian actor from Salt Lake City, who has starred in a movie called Saint Street. Name: Jarrod Phillips. I met a cute little Filipino lady who has been a single mother for 14 years, and living day to day selling lumpia (egg rolls: for the mainstream people), but is now able to supplement her income with her EO business. This was special to me because I grew up with lumpia, my best friend from childhood is Filipino and this little lady only lives about an hour a way. That means I can buy lumpia from her! I met a lady who moved to Utah from Arizona to be closer to her family while she was dying. She was exposed to toxic mold and it was taking a toll on her. She was overweight and in a wheelchair. She got started on Life Long Vitality and the oils. SHE is now a beautiful walking, talking, clean bill of health! Obviously hanging out with Alysse, a multi-millionaire (of Alysse's Bridal - which she sold a while back), was a blessing. She shared the ways she shares her wealth, and even told a story of why she would not do "It Works" business. I met a lady who did Pampered Chef for 10 years, and now makes 10,000 a month. She changed because Pampered Chef wasn't really residual, but this one is, and she is so happy with her new business, but of course still buys Pampered Chef because it is awesome stuff! 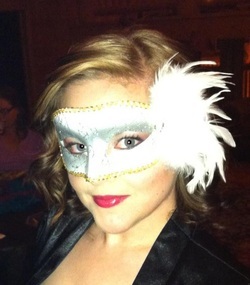 My most favorite moment was when a girl got up for the talent show we had the night of our Masquerade Ball. She played the piano and sang a song that she had written. She shared how she had 4th Stage Lyme Disease, and prayed for healing, and was healed, and a story about a little boy who her and her church prayed for, but his healing looked different - he went to heaven, and this song she sang was birthed out of these experiences. As she began to play and sing, I began to sing to myself. I thought "How could I know this song?" I realized what was happening; it was my favorite song! I think the people at my table thought I was nuts. It took everything in me to not stand up, raise my hand, and worship at the top of my lungs. For sure then, everyone would have just known I was nuts! Come to find out, the song she wrote is sung on Christian Radio by a few artsts. The one I knew was by Natalie Grant - Your Great Name. I told the girl, Name: Krissy Nordhoff that that was my FAVORITE song. She was in disbelief = ) and was so appreciative. What a way to end the last day of the retreat! Well, the day came when it was time to make that hour and half trip home. 15 hours of sleep in three days, a load of information, new friends and inspirations. 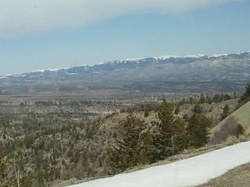 I had lots to ponder and beautiful scenery to look at so the trip home went pretty fast - even though I was little tired. I know. Long post, but so incredible. I have an incredible company, with incredible life changing products. 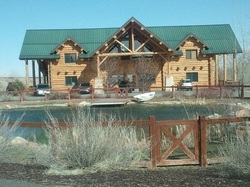 How is this EO company different than any other marketing company? Just ask and I will tell you! How can you get to one of these events? Just ask, and I will show you! What are you afraid of?! I went on to the next paragraph; it got worse. decide not to go to my burial after all. out halfway through because of the weather?!" For him this was liberating, after the first thought of being bummed, he realized how this freed him up.....It should make you think twice about how you do this thing called life! "You know what? I thought. I don't give a damn what anybody thinks of what I 'm doing any more. do...then why am I spending so much time worrying about what they're thinking now? This is one of the things I struggle with the most - worrying that someone won't be interested or won't care or won't believe what I have to say; it holds me back in more than just business, it holds me back in life and in expressing myself. In turn, I just may be hurting someone, but will never know it. I'm pretty sure the Bible talks about worrying about what's going on in the here and now, and not doing things for what the future. Of course the Bible is talking about Heaven, and I am referring to your business and dreams. This doesn't mean you stop caring about people; it just means you don't let their thoughts and opinions get in the way of the forward motion of your dreams and business! Hi!! Where some of you are only here for the EO info, I don't like posting things twice, but sometimes things just cross over, but I will try and just send you a link to the other page so you don't have to read it twice. My blogging friend Stephanie at Hope for Healing held a giveaway for me. for some Lemon Oil and she created an awesome recipe. 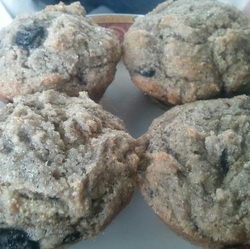 Even though you may not be gluten free, it may give you some inspiration to make some muffins of your own with the oils. This link will send you over to the recipe page to read what I wrote, and this link send you right to Stephanies page. And remember, if you would ever like to know more about using and purchasing Essential Oils, please use the contact form. Any questions you may also comment. People can learn so many things just from a comment conversation! I am even putting together packages for people who would like to commit to one on one consultations. Just let me know!